The sun has decided to make a late summer break appearance, so we were in the mood for ice cream! My mum (and gran!) had both recommended going to a new ice cream parlour that has recently opened in Whitburn. We (my sister, MrJ and I) decided to venture across there for lunch today. The place is small, but has plenty of seats and I liked the fifties diner theme with booths and high stool chairs. They have amazing choices of ice cream, and some flavour combinations I’ve never seen before like Horlicks flavoured ice cream with crushed up Malteasers inside the ice cream! 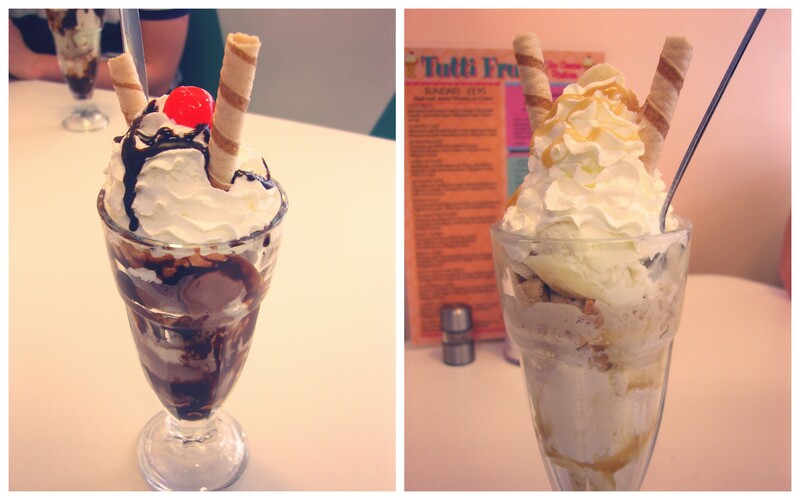 All of Tutti Frutti‘s ice cream sundaes are named after an Elvis Presley song (so my Gran told me!) I got the Jailhouse Rock (chocolate and vanilla ice cream, marshmallows and crushed digestive biscuits), my sister got the Be-Bop-A-Lula (banana and vanilla icecream with real banana pieces and crushed digestive biscuit!) and MrJ got the Honky Tonk (pistachio ice cream, hazelnut ice cream with crushed hazelnuts, peanuts and pistachios)! They all went down a storm, and I certainly would have one again. They were also pretty huge so fitted the £3.95 price tag per sundae. Tutti Frutti also have other options apart from sundaes like waffles + ice cream, brownies + ice cream and other tubs and cones! The only drawback to the menu is that there doesn’t seem to be an option to just have 3 scoops of whatever ice cream flavours you like. I’m pretty sure if I asked the girls for it, they wouldn’t have minded and served up whatever combination I wanted, but it would be nice to have that option on the menu, as it looks like you can only have one scoop of ice cream you want, or you have to have a sundae combination! Archers Jersey Ice Cream in Jesmond. Risis Ices on Newcastle Quayside. Lickety Split Creamery and Juice Bar in Seaham.